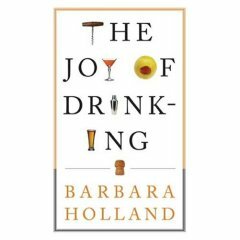 One of the best monikers that’s ever been given to me is that of “gin connoisseur.” I wrote a review of a really engaging, informative little book called The Joy of Drinking by Barbara Holland, which appears in the current spring issue of Gastronomica: The Journal of Food and Culture. My friend and colleague, Darra Goldstein, is the founder and editor of the journal, and that’s the title she added to my byline for the review: Cynthia Nims, gin connoisseur. She and her husband are a couple of the converts I’ve helped turn on to the world of top-quality gins in the past couple of years. They became particularly enamored of Hendricks and are apparently now never without one of the distinctive stubby brown bottles on their liquor shelf. While I was preparing to moderate a panel on gin for the conference of the International Association of Culinary Professionals last year, I made a diligent effort to collect as many gins as I could for sampling, amassing as many as 9 or 10. One evening, a half dozen colleagues joined me around our back patio table for a blind tasting, one of the most fascinating spirits exercises I’ve ever been through. I was honored to have none other than Robert Hess on hand to help orchestrate the proceedings (check out his great cocktail videos here). We first sipped the gins straight, as is, then again with a small drizzle of water added. Scotch drinkers know that a small drizzle of water into the pure spirit really opens up the character and aroma of the drink without diluting its flavor. Even if you just try two different gins side by side in this way, you’ll start to appreciate the nuances that separate one brand from the next. What I found so inspiring in my research was the number of small-batch gin producers there are in this country, from Chicago’s North Shore Gin No. 6 to the wonderful Aviation gin distilled in Portland, my friend Ryan Magarian one of the collaborators on that tasty product. There’s really a wonderful renaissance of gin going on. I think the most salient reason is that people are increasingly seeking out flavor, variety and craftsmanship in their bar selections the way they have been in their food choices for so long. I consider gin to easily be the most “culinary” of all spirits. The distiller, like a chef, has choices to make about which ingredients to use and what technique to employ in the distillation process. Juniper is a required base ingredient, but countless spices, herbs, flowers, roots, zests and other aromatics can embellish the spirit. For gin lovers, it’s a joy because there are plenty of different styles of gin to choose from, with broadly different flavor profiles, so you can pick a specific gin to suit a particular mood or cocktail. I love Plymouth for a smooth martini, classic Bombay for a gimlet and Hendricks or Martin Millers simply on ice with a dash or two of Fee Brother’s Grapefruit Bitters. 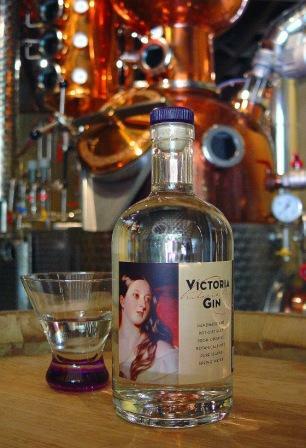 I’ve just gotten a press notice about the launch of a new gin distillery on Vancouver Island, Victoria Gin produced at Winchester Cellars. And there’s a new gin distillery in the works for my own backyard: Woodinville. Claiming a little spot of real estate among all the winery tasting rooms is Pacific Distillery; the copper still is en route and they may be bottling their first gin later this year. Heavens, once I get started on gin, I just can’t seem to stop. (Writing about it, I meant, but I guess the same is sometimes true of sipping it.) I’ll surely revisit the subject again soon. Especially after I get a sample of those new Northwest gins coming on the scene. I’m off now to add “gin connoisseur” to my resume. And maybe my business cards.